You might feel that creating ambient lighting in a living room with both masculine and feminine appeal is quite a challenge. Affordable drum fixtures, however, can make this much easier. You can determine if a drum fixture is right for indirect light in your feminine lounge or task lighting in your masculine kitchen. 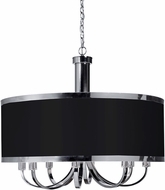 Use your instinct and the following tips to decide if drum shade chandeliers or other drum pendants are beneficial to your bachelor pad bathroom or your family hallway. 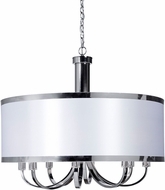 Why use drum pendant fixtures?�It depends on personal preference. 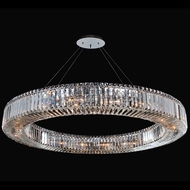 You may feel that pendant drum lights are attractive, practical and casual. In addition, fabric covered drum gives a uniquely soft glow. 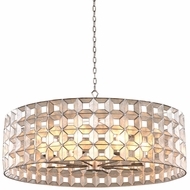 If you like the soft glow of these fabric shades, you might consider natural fibers such as those used by�Uttermost Lighting�when you choose discount drum pendant products from Affordable Lamps. 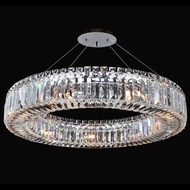 Our commitment to quality drum pendant items is what sets us apart from the cheap drum lighting that can be found in home improvement stores. 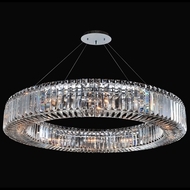 Where are some suggested locations in the home?�Since there are no rigid rules on where these drum pendants can be installed, you have the option to place this type of soft lighting in the kitchen. 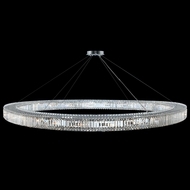 You can consider installing a pendant drum light above a round table or countertop in the kitchen. 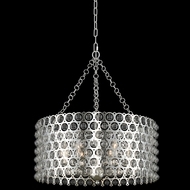 You can also suspend a drum pendant fixture over a low coffee table anywhere in the living room. 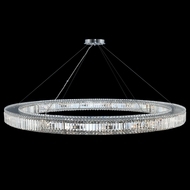 In fact, many people enjoy these suggested placements of these discount drum pendants and drum chandeliers. 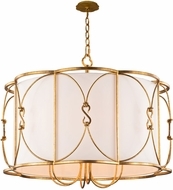 What materials are used for these drum fixtures?�These pendant drum fixtures can be made out of wire, crystal, and fabric. 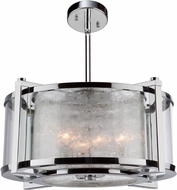 Such fixtures can also be made out of chrome or stainless steel for contemporary styles. 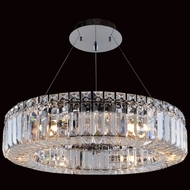 The fixtures in drum chandeliers may be made out of mica glass or wood veneers. 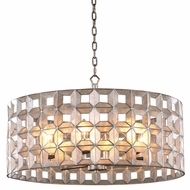 Faux wood finish shades by�Trans Globe Lighting�are especially pleasing. 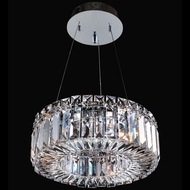 What is a less common place to hang a drum shade chandelier?�Let's say that you want this type of light for your bedroom. Measure to see how much headroom you need when you sit up in bed. 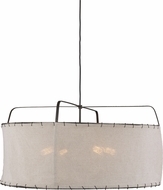 Then you can hang a fixture over the foot of your bed. You can also flank your bed with identical fixtures and inexpensive drum chandeliers instead of using traditional wall sconces or table lamps on bedside tables. 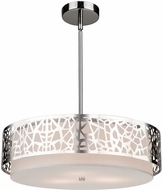 A white silk shade by�Quoizel Lighting�is particularly fetching when paired with our drum pendant lighting, but you can choose other brands with shade patterns in abstract rose laser-cut metal and other styles in our drum pendant sale. 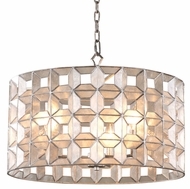 What drum pendants can I use if I want it for my hallway?�You may want this hanging light to be low enough to be within sight but high enough to provide clearance for adjacent doors. 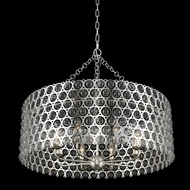 Hanging the best drum pendants in this way is probably your number one option for using drum pendant lights in a hallway. It's true that you can use�Elk Lighting�for task or ambient lights. How high should I hang my pendant drums if I want it for a stairway?�You can choose to spice up a plain-looking stairwell with a sculpture-like fixture. However, make sure you hang the fixture at least 18" above the head of the tallest person in your house. You want to make sure no one will bump his or head on the drum pendant lights descending or ascending the stairs. 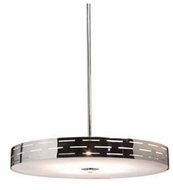 Can I use drum pendants in my home office?�If you have a long rectangular conference table, you can double up or even use three drum pendant lights in a row. You can have these dimmed. This way you can adjust the brightness for business presentations to clients. 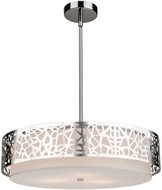 Pay attention to fixture size and ceiling height to judge the right proportions for your selection when you buy pendant drums for your office from our drum fixtures sale.om/quoizel.html">Quoizel Lighting is particularly fetching when paired with our drum pendant lighting, but you can choose other brands with shade patterns in abstract rose laser-cut metal and other styles in our drum pendant lighting sale.